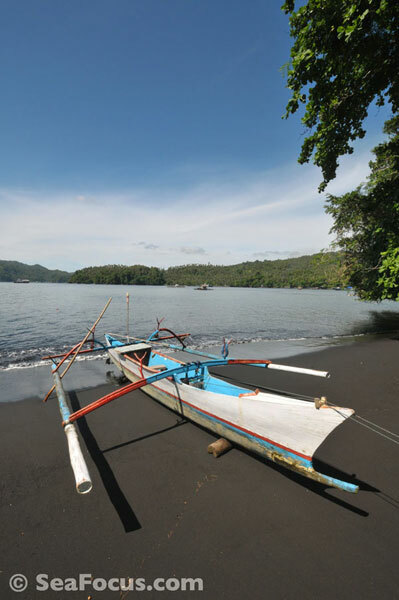 Located north of the city of Bitung on the North Sulawesi coast and opposite Lembeh Island. Transfer time from Manado airport is up to 2 hours. 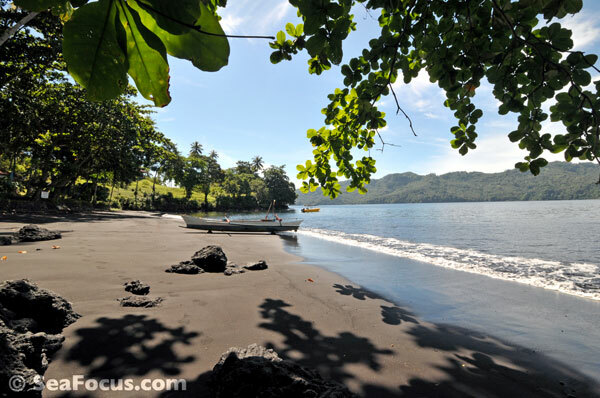 True to its name, Black Sand sits above a dark, black sand rimmed bay. 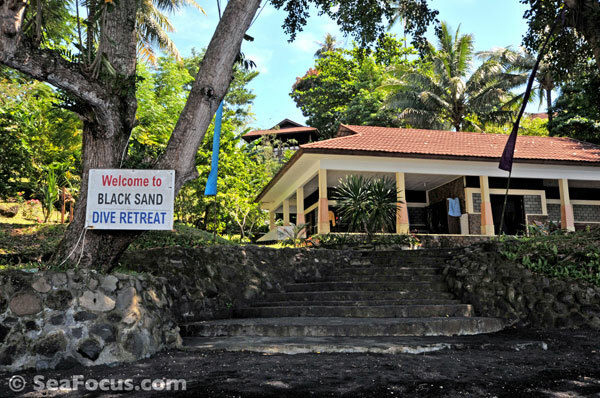 The resort and dive centre are owned and operated by Canadian, Bruce Moore and his Indonesian wife, Fung. Bruce has a long history of diving in the Lembeh Straits having been there almost since the beginning of it's development as a diving region. He is incredibly knowledgable on the dive sites and marine life and will have long chats filling you in on details such as where animals are spotted and what creatures are currently about. 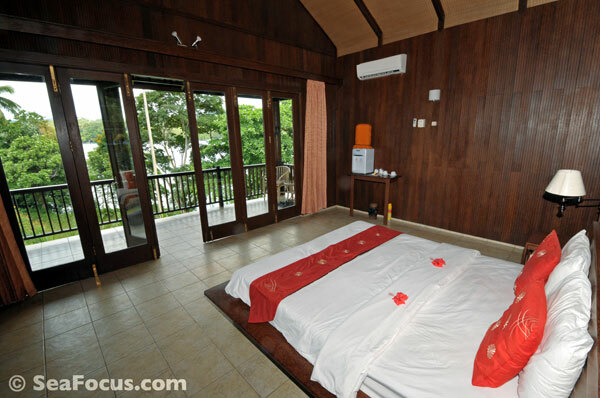 Bruce's passions are the marine life and underwater photography, which tend to be the focus of this small resort. 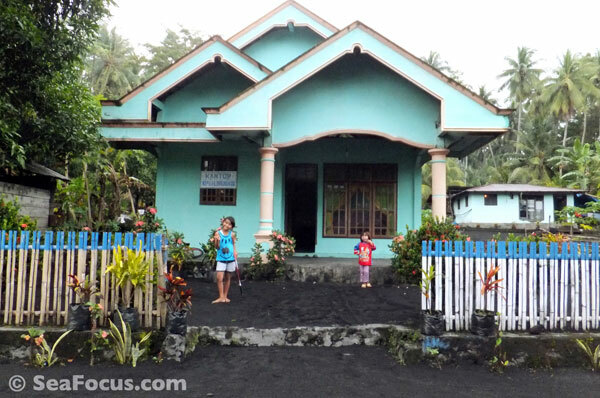 Located on the hill above Kambahu Bay, there are just six individual bungalows at Black Sand Dive Retreat and each one has been thoughtfully positioned in the gardens so that no one can see – or hear – anyone else. 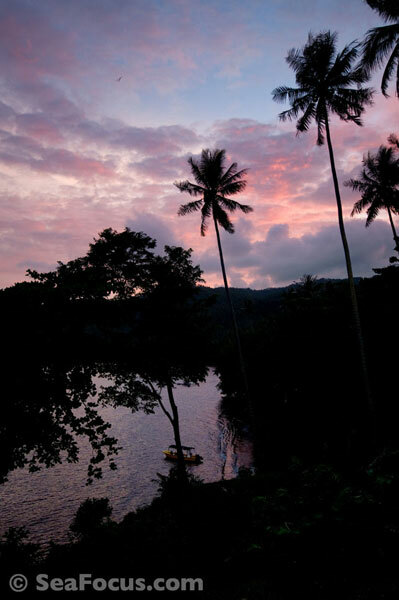 There is a lovely sense of privacy sitting on the balcony and looking out into the Lembeh Straits past the tropical trees, plants and flowers. For nature lovers this is a real bonus as the gardens also attract a huge variety of birds and spectacular butterflies. The cabins are spacious and, being built completely in coconut wood, are really attractive with simple furnishings, air-con, ceiling fan, a table and a huge drinking water dispenser. The bathroom is outside and has it's own mini-garden as is the style in Indonesia but it's well-equipped and spacious. There is a central restaurant and relaxing area, with free wi-fi, a TV room and plenty of ID books. Meals are included in dive packages and are another great bonus at the resort. Fung Moore has designed some really excellent menus with delicious regional and local dishes. There are three courses at lunch and dinner and three choices for each course, but we never got past trying as many Minahasa dishes as we could. Breakfast tends to be quirky, which is understandable as cooking an English breakfast doesn't come naturally to the local people and the resort aims to employ as many as possible from the neighbouring two villages. It's worth adding that drink prices are reasonable, something that you can no longer rely on in many diving resorts that are located away from other facilities, although the resort doesn't stock wine as it has become difficult to source it in certain parts of Indonesia. Directly behind the resort is a small village. There's not much to see, but you can hear music or activity from the church at times. It's worth walking through it though as the people are welcoming, the kids are friendly and if you want to explore the rainforest on the far side, the staff will give you directions. 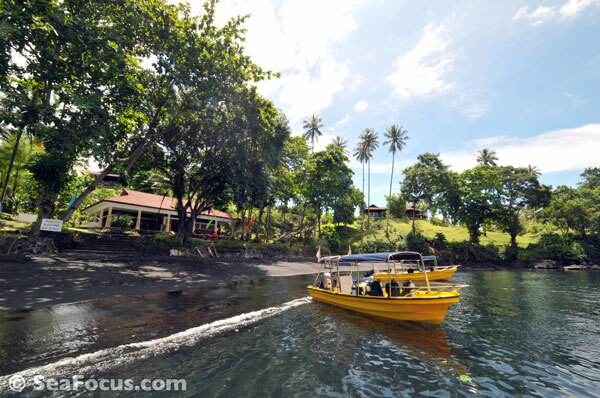 The dive centre is located at the bottom of the hill and a few steps from the shore. There is a nice kitting up area and each room is allotted their own corresponding wooden cubicle to keep kit all in one place. There is hanging space for wetsuits and hooks for bits and pieces. To the side there is a row of rinse tanks for cameras, which are in the shade and beside them is a huge camera room with work stations and shelves so you can play with your camera in between dives, charge batteries and so on, without having to return uphill to your cabin. There are also more rinse tanks for wetsuits, showers, sun loungers and space to sit and relax if you want to. Dives are organised individually, returning to the resort in between each one. There are two morning dives, with coffee and snacks served at the dive centre during the surface interval. 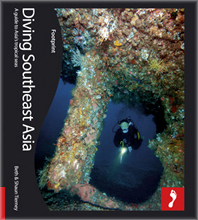 An afternoon dive takes place after lunch and dusk or evening dives are by arrangement. The resort has three little fibreglass boats that have a shade canopy and are quick and easy to manoeuvre. These boats are quite small but each boat only ever goes out with a maximum of four guests with one divemaster so there is always a high level of personal service. SeaFocus resort reports are 100% personal opinion: things change and you may not agree with us if you go. We can only tell you what we thought about it when we went! Where do you want to go diving?